← FRIDAY FUNNY… Dead End. Our South Australian legislation leads the country in making it lawful, and absolutely acceptable, for graves to be re-used if the lease has not been renewed. I am so ashamed. You can read about my views HERE. Back in June 2013 it was a shock to discover my Great Grandmother’s grave had one of those lease renewal notices on it, despite me spending much money to back pay the lease, and keep her safe for a few more years, whilst sorting out what this was all about. Thankfully it was confirmed, by the records department of the ACA, that her lease was indeed paid up and the notice had been removed. However, questions about the process remained ignored, and unanswered for some three months, until eventually I took my questions to the “higher authority” ie. the Attorney General’s Department which oversee the Adelaide Cemeteries Authority in it’s management of Cheltenham, West Tce, Enfield and Smithfield cemeteries, on behalf of the South Australian Government. It was most pleasing to get a full and detailed response, especially in regard to the order in which Cheltenham gravesites, with unpaid leases, will come up for redevelopment. If you missed that post, please click HERE to read. One of my questions was in regard to the preservation of the graves of our Pioneers at Cheltenham Cemetery. This was the response. Okey Dokey… great info and now it was time to go to the ACA’s “Significant Places Policy” to see how this actually protects the graves of our pioneering Ancestors. Q: Am I able to ask that a gravesite be protected under the “Significant Places Policy” of the Adelaide Cemeteries Authority? Q: What is the criteria for having a gravesite declared a “Significant Place” and therefore protected from being re-used if the lease has not been renewed? 1. Design or layout of a cemetery, or part thereof, reflects history and cultural heritage or a movement in cemetery planning. 2. A structure within a cemetery is unique or unusual. 3. A structure within a cemetery reflects a particular style or trend in design. 4. Trees or vegetation of significance or expected to become significant in time. 5. Remnant vegetation at West Terrace Cemetery. 6. Expresses a particular group’s identity. 7. 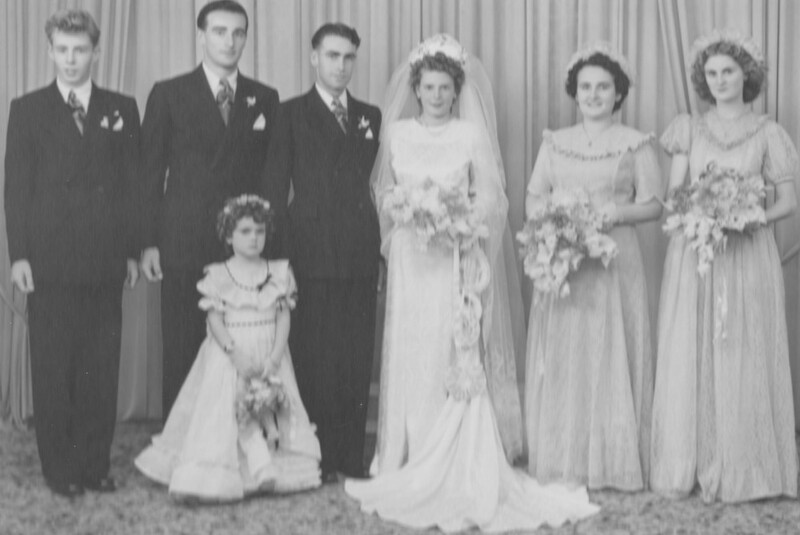 Reflects the diversity of the Australian community, including social values and customs at a particular time. 1. A monument has unique or unusual masonry qualities. 2. A monument is a good example of a particular style of trend of monument design. 3. 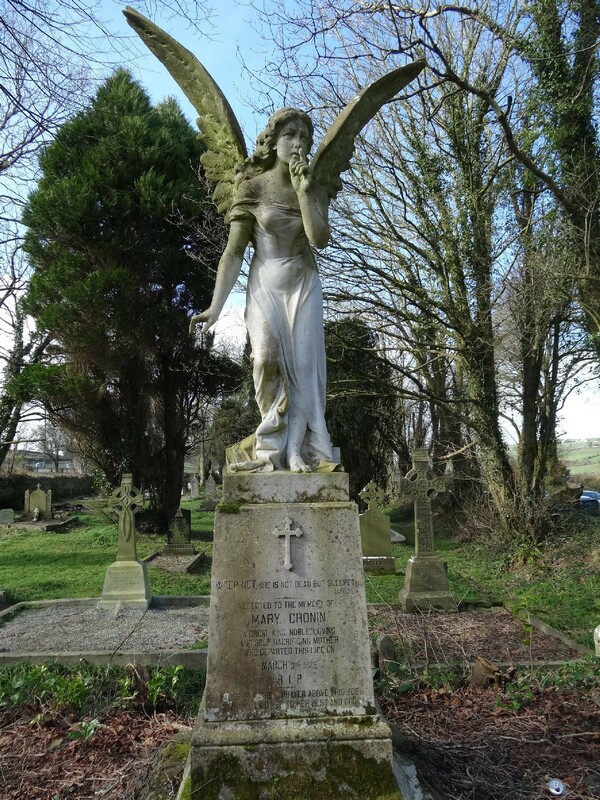 A monument denotes a significant date or incident in the history of a cemetery or the community. 1. The site played a significant role in the development of the cemetery, that is, the first grave site, the first cremation memorial site. 2. The monumentation is dedicated to a particular group who have served the country or the community. 1. The person’s international, national or local achievements. 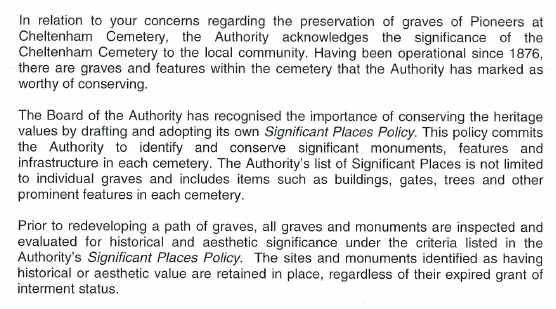 Hmmm… I’ve always found Policy docs such a pain and often difficult to grasp… so my next step was to check out those gravesites, at Cheltenham Cemetery, which have been declared “Significant Places” in order to get a better understanding of how this “Significant Places Policy” has been applied, and actually works, in real life. Once I’ve got this sorted, in my own head to the best of my ability, I will post here. In the meantime maybe you’d like to check the policy out for yourself and post some of your own ideas and thoughts in the comments section below. Thankyou GPCox for showing your continuing support, and that you actually read the messages I post here, by your *like* . Much appreciated. Thanks also to those many South Australians whom send me private messages of support yet choose not to make this public… and I keep wondering why??? Is there some sort of danger in actually reporting “the truth” and am I missing something?